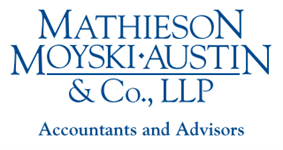 Mathieson, Moyski, Austin & Co., LLP is an accounting firm in Wheaton, Illinois. Our CPAs, tax accountants, and financial advisors have been serving our clients since 1987, helping them meet their financial goals. The partners and staff of Mathieson, Moyski, Austin & Co., LLP are deeply connected to the community and to the people we serve. Our mission is to be the trusted advisor to all our clients, from business enterprises to families, providing responsive, professional financial services of the highest quality in DuPage County area with a focus on Wheaton, Glen Ellyn, Carol Stream and Chicago's western suburbs. If you need help with your personal taxes, business accounting, or choosing the right investments, please call us at 630.653.1616 today. We look forward to serving you! If you are a business owner looking for information about how we can help you with your accounting, taxes and financial planning to help you manage and grow your business, please click here. If you are an individual looking for information about how we can help you with your tax planning and preparation and/or your financial plan, please click here.